Yakisoba is Japanese street food. In Tokyo, we lived on the edge of a park that hosted an annual plum-blossom festival in March. 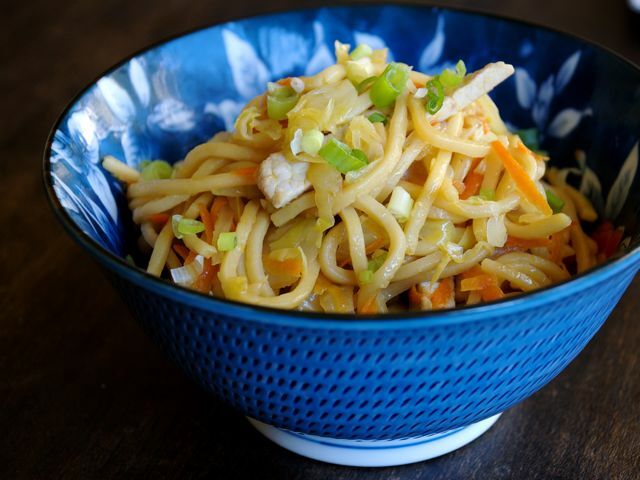 I have vivid memories of groups of neighbors gathered beneath the white blossoms and, there to feed them, the yakisoba man, decked out in his red-and-white bandanna before a huge griddle of these noodles, flipping with all his might. Served in the traditional way, yakisoba is an oily but tasty business plopped unassumingly onto a plate, with a blob of bright red pickled ginger on the side. It is made not with soba, as you might expect, but with the Chinese-style ramen noodle. My version is lighter and less oily, but very flavorful. A nice dish for a cool fall or winter day. Use fresh noodles if you can get them — sometimes you can find fresh thin wheat noodles in the health-food section of the grocery store. They cook faster than dried noodles. Cut the pork into thin 3-inch slices against the grain. Combine the soy sauce, rice wine, and sugar in a small bowl. Stir to dissolve the sugar. Heat the oil in a large sauté or chef's pan (with a lid) over medium-high heat. Add the onion and stir-fry for 3 minutes. Add the cabbage, carrot, and ginger. Stir-fry until the cabbage is wilted, 3 to 5 minutes. Add the pork and continue stir-frying for 2 minutes. Put the noodles on top of the mixture and pour the sauce over the whole thing. Cover and cook for 3 to 5 minutes. Lift the lid and combine the mixture with tongs so that everything is well mixed. Make sure the pork is cooked but remains tender. Transfer to a serving platter and garnish with the scallions.